Brazil was the country which featured the greatest number of times, with 17 cities on the list, followed by Mexico, Venezuela and the United States. The list was compiled by Mexican anti-violence think-tank Seguridad, Justicia Y Paz (Security, Justice and Peace) and ranks each city according to homicide rate per 100,000 residents. In the case of St Louis, researchers found it had 205 murders in 2017 of a population of 300,000 for a murder rate of 65.83 per 100,000 people, ranking it 13th. Violence in the state of Missouri has been bubbling under since the Ferguson riots of 2014 and 2015. Authors found that, compared to 2016, there has been a marked decrease in violence in Honduras, with its only two cities on the list dropping from third and fourth to 26th and 35th respectively. The report praises the Honduran government for its efforts to tackle organised criminal gangs and restore order in prisons as being behind the drop. Another country which saw a drop in violence was Venezuela, although this was not a good thing, the report says. The reason for the drop is not because of a fall in violence, but a weakening of government control meaning authorities can no longer effectively count the number of homicides in their cities. 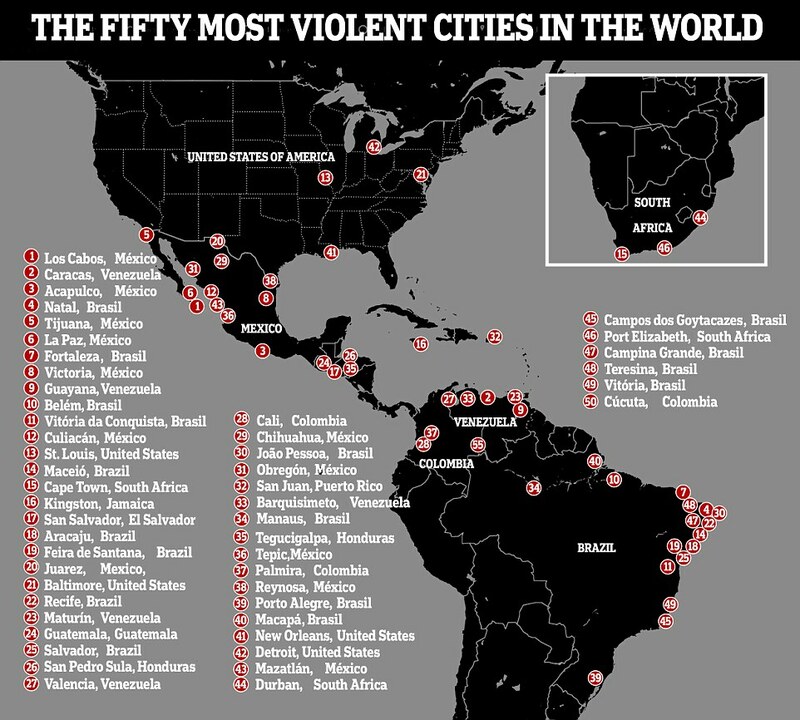 Researchers point to two cities - Cumaná and Gran Barcelona - which were removed from the top 50 table but only because they could not effectively establish the murder rate. Venezuela was gripped by often violent anti-government protests in 2017 amid widespread starvation and allegations of corruption against the regime of Nicholas Maduro. Meanwhile violence in cartel-plagued Mexico saw a sharp rise in 2017, the report says, with 12 cities included on the list where there was just five back in 2015. That decline is reflected in the nationwide homicide rate which hit a record 29,000 last year, topping the previous peak at the height of the country's drug war in 2011. The figure was the highest since records began in 1997. Turf battles caused by the emergence of the Jalisco New Generation cartel is believed to be responsible. San Salvador, in El Salvador, home of the bloodthirsty MS13 gang, also features at number 17 on the list. The highest-ranked North American city was St Louis, Missouri, which came in at number 13 with a homicide rate of 65.83 per 100,000 residents. The other three to feature were Baltimore, New Orleans and Detroit. One city from Guatemala, Puerto Rico and Jamaica also appears in the rankings, as do three from South Africa.